Arab terrorist shot in the leg while trying to steal a Border Patrol officer's weapon outside a base in Kiryat Arba. An Arab terrorist in his 20s on Thursday evening tried to steal the weapon of a Border Patrol officer at the entrance to the Border Patrol base in Kiryat Arba, adjacent to Hevron in Judea. 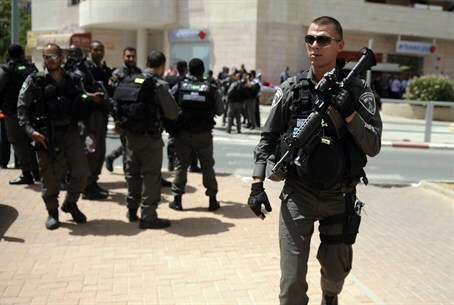 The terrorist was shot in the leg and lightly wounded. He was then arrested and is currently being administered with medical treatment at the site. Security forces will then take him in for investigation. Two stabbing attempts were foiled on Sunday at Hevron's Cave of Machpelah where the Jewish patriarchs and matriarchs are buried. In one instance, an Arab terrorist from Hevron arrived at a checkpoint adjacent to the Cave where he aroused the suspicions of Border Patrol officers who detained him. He was found to be carrying two large knives, upon which he was arrested and taken in for questioning. Several hours later, another Arab terrorist was arrested at another nearby checkpoint, after similarly exhibiting suspicious behavior. He was found to have a knife in his backpack and was likewise arrested. The Machpelah Cave area has been a popular target of attack attempts, with three similar stabbing attempts being foiled in the past month alone according to IDF officials.